During the colonial period, most British army units posted in the area that would become the United States had bands attached. The first recorded instance of a local American military band was in 1653 in the New Hampshire militia. The oldest extant United States military band is the United States Marine Corps Band, formed in 1798 and known by the moniker "The President's Own". The U.S. armed forces field eleven ensembles and more than 100 smaller, active-duty and reserve bands. For more than 100 years, American martial music was based around the fife. For hundreds of years, military forces have used music to signal their troops. Evidence of the attachment of musicians to military units operating in what would become the United States dates to 1633, when colonial Virginia militia employed drummers to beat marching cadences during drills and maneuvers. According to research by the U.S. Armed Forces School of Music, the first complete military band in the American colonies was organized in New Hampshire in 1653 with an instrumentation of 15 oboes and two drums. The exposure of Americans to martial music increased with the growth of the number of British Army units being rotated through the colonies; most British infantry regiments had military musicians attached, consisting of both field music units that sounded signals during combat, as well as "Bands of Musick" that performed for special and ceremonial occasions. Early American military music was centered around the fife, with brass instruments only slowly adopted. At the outset of the American Revolution, United States military units primarily relied on fife and drum corps for musical support. Americans were first introduced to the bugle horn (forerunner to the modern bugle) during the Battle of Harlem Heights, when British infantry used the instrument, causing Joseph Reed to later recall, "the enemy appeared in open view, and sounded their bugles in a most insulting manner, as is usual after a fox chase. I never felt such a sensation before—it seemed to crown our disgrace." Some American cavalry units adopted bugle horns during the war, however, a shortage of brass in the Thirteen Colonies largely limited use of the instrument to the opposing British and German forces, with American troops continuing to rely heavily on fifes, drums, and even – at the Battle of Saratoga – turkey calls. Among the most noted American military musicians during the revolutionary period was Barzillai Lew whose fifing during the bloody Battle of Bunker Hill has been credited with keeping troop morale high. The end of the revolution came "the end of everything military" in the United States and it was not until 1798, with the establishment of the U.S. Marine Corps, that military music returned in an organized fashion. In the enabling legislation authorizing the creation of the Marines, Congress authorized the funding of a Drum-Major, Fife Major and 32 musicians. This band, the U.S. Marine Band, as of 2015 remains the oldest extant military music organization in the United States and, indeed, the oldest professional musical ensemble in that nation. The establishment of regular U.S. armed forces brought with it a standardization of uniforms. Federal soldiers and marines wore a variety of uniforms based around the basic color blue with the exception of bandsmen whose uniforms were patterned in red to allow them to be more easily identifiable to field commanders who would need them to signal his orders to troops. The use of red in musician's uniforms is maintained to varying degrees by U.S. military bands today, as seen in the uniforms of the U.S. Marine Corps Band, the U.S. Marine Drum and Bugle Corps, the Old Guard Fife and Drum Corps of the 3rd Infantry Regiment, and in the peaked hats of the U.S. Army Band which are colored red in contrast to the standard U.S. Army blue design. The modern bugle was first introduced to American military units around the time of the War of 1812. During that conflict, only the Rifle Regiment was authorized to use the bugle. All other American forces were required to continue using the traditional American fife. Gradually, however, bugles became more widely adopted by the United States military. At the time of the American Civil War, U.S. Army bands had a normal strength of 24 musicians for infantry units, and 16 for cavalry. With the mobilization of the Union Army, transition to total war, and decreasing importance of bands in signaling troops, the United States Department of War in 1861 considered cutting military bands entirely, estimated a potential cost savings of $5 million. The proposal was shelved in the face of opposition from officers and soldiers, however, a trimming of bandsmen occurred by eliminating some regimental ensembles in favor of brigade-level bands. Nonetheless, a survey in October 1861 found that 75-percent of Union regiments had a band and, by December of that year, the Union Army had 28,000 musicians in 618 bands. Bandsmen were also, for the first time, tasked with performing combat duties in addition to musical performance, frequently as stretcher-bearers and field hospital orderlies. John Philip Sousa, pictured here in the 1880s as commander of the U.S. Marine Band, is credited as America's greatest composer of martial music. In the post-war era, aided by the large body of work being created by prolific American composers such as John Philip Sousa, Henry Filmore and Edwin Eugene Bagley, American military and military-like bands became known for performing a unique style of quick-tempo marches with thundering brass and heavy percussion. One music critic, writing about the Boston Jubilee of 1872, contrasted the "velvety smoothness" of the invited Band of the Grenadier Guards to the follow-up performance orchestrated by U.S. Army bandmaster-general Patrick Gilmore which involved "a heterogeneous choir of nearly twenty thousand, an orchestra of about a thousand instrumentalists of decidedly mixed abilities, an organ blown by steam power ... a drum of the most preposterous magnitude, and a few batteries of artillery." The mounted band of the 2nd U.S. Cavalry leads the parade at the 1902 encampment of the Grand Army of the Republic. By the early 1900s military bands were being established in the far-flung reaches of the American colonial empire. Most notable among them was the Philippine Constabulary Band under the direction of Walter Loving. The group, described by Army and Navy Life as "one of the finest of all military bands in the world," and credited with John Philip Sousa as being equal in quality to the U.S. Marine Band, led the 1909 U.S. presidential inauguration parade, the first time a band other than "The President's Own" had done so. During World War I, the U.S. armed forces experienced a great influx of professional civilian musicians resulting, in part, from the mobilization of 27 African-American regiments to augment the U.S. Army's existing four black regiments. The regimental bands of these newly formed units were frequently led by black blues and jazz musicians experienced performing in the clubs of New York and Chicago. Among them was James Reese Europe, whose 369th Regiment band (the "Harlem Hellfighters Band") is credited with introducing jazz to Europe. Regimental bands during this time varied greatly in size and quality and "intensive recruiting by an ambitious colonel with a band fund and an able conductor might coax a significant number of voluntary enlistments and result in a flexible, professional-quality ensemble." A U.S. Army band leads the entrance of American troops into Verdun, France in 1944. In 1949 the U.S. Air Force established the USAF Drum and Bugle Corps and a USAF Pipe Band. The former group continued until it was eliminated in 1961 as a cost-cutting measure. The USAF Pipe Band was deactivated nine years later, in 1970. By the 20th century military music had effectively ceased to be an integral part of combat operations with the existence of military bands becoming a function of public duties and troop morale and welfare. Occasional exceptions existed, however. One later example of the use of a band in combat occurred during the Vietnam War when U.S. Army Major-General John Hay ordered the 1st Infantry Division band to march down a road held by the North Vietnamese Army (NVA) while playing the "Colonel Bogey March". NVA forces were, reportedly, so confused by the impromptu parade that they withdrew from the area, allowing American infantry to seize the road without opposition. A U.S. Army bugler performs "Taps" at Arlington National Cemetery. In 1992 Senator Sam Nunn – fighting to stop closures of U.S. military bases in his home state as part of the peace dividend – instead suggested elimination of military bands that support the U.S. Military Academy, U.S. Naval Academy, and U.S. Air Force Academy. Nunn said that cadets and midshipmen should volunteer to form their own bands instead, which would save the U.S. up to $10 million. Representatives of service academies responded by explaining that, due to the unique nature of cadet life relative to student life at civilian universities, it would not be practical for volunteer ensembles to replace the academy bands. The proposal ultimately became stalled in a larger debate about trimming $1 billion from the Strategic Defense Initiative and did not move forward. In 2011 Rep. Betty McCollum, responding to a proposal she opposed that would curb funding for the Corporation for Public Broadcasting, called for 40-percent of military band budgets to be slashed. McCollum's suggestion was decried by the Fleet Reserve Association and described by the National Association for Music Education as "potentially devastating." The McCollum bill was initially defeated, but reintroduced by the congresswoman a second time, when it narrowly passed with bipartisan support. It was ultimately dropped by the U.S. Senate. In 2012, McCollum again attempted to defund military music programs by reintroducing her amendment. In an effort to preempt further action by McCollum, the U.S. Air Force proactively disbanded the Band of the Air Force Reserve, the Band of the Pacific-Alaska, and the Band of Liberty. At the time of its deactivation, the Band of the Air Force Reserve was the Air Force's oldest musical ensemble, founded in 1941 as the First Air Force Band of the U.S. Army Air Corps. In addition to the three active-duty bands, six of what were then eleven Air National Guard bands were also deactivated. In 2016, U.S. Representative Martha McSally, a Republican from Arizona, introduced an amendment to the defense spending bill to remove $430 million in funding for military bands to eliminate their performing at concerts, parades, dinners and other public events. The amendment passed the House of Representatives on a voice vote and now goes to the Senate. McSally said military bands would still be allowed to play at military funerals and certain ceremonies. Though largely phased out through the rest of the U.S. military, the U.S. Army Band "Pershing's Own" retains the tradition of the "eagle drum". During the American Revolution, some military units, lacking heraldic insignia, painted eagles on the facing of their drums (in the British custom a regiment's armorial achievement would be used to decorate drums). This tradition continued after the war, and the decoration of drums with eagles in various poses, often dictated by the tastes of the individual band, continued. By the War of 1812, eagles were required to be painted on a blue ground for infantry units and red for artillery, though the design of eagles remained a largely individual art. Beginning in the 1840s, the U.S. Army attempted to standardize the eagles used on drums and, by the Civil War, stencils were issued to bands to apply the authorized designs, though some flair continued in the finishing and painting of the final product. With the later establishment of the Army Institute of Heraldry, eagle drums were phased out in favor of drum designs emblazoned with distinctive unit insignia, a return to the British tradition. Today, The U.S. Army Field Band and the U.S. Army Band "Pershing's Own" use "eagle drums". Those drums feature a eagle designs created by Gus Moeller known as "the Grand Republic". Most U.S. military bands are issued a set of regalia, which typically include a baldric worn by the Drum-Major charged with the distinctive unit insignia of the unit to which the band is assigned and, frequently, other symbols as well such as miniature campaign streamers; a chrome mace carried by the Drum-Major and engraved with the unit's name; and a special mural unique to the unit used to wrap the band's drums. Drum-majors often augment their uniforms with bearskin helmets and white leather gauntlets. Some U.S. Army units have officially recognized unit marches. Army units with attached bands can adopt a unit march or song at the request of the commanding officer and approval of the United States Army Center of Military History. Units with official marches and songs include the 1st Infantry Division ("Big Red One Song"), the 3rd Armored Division ("Spearhead Song"), and 7th Infantry Division ("New Arirang March"), a d the 3rd infantry division ( " dogface soldier") among others. The West Point Band, a premier ensemble, passes in review. A U.S. military premier ensemble is a military band given special status within the U.S. armed forces. Such groups are configured and commanded in a way intended to attract the highest-quality musicians available and competition for enlistment is typically fierce. Unlike non-premier ensembles, which provide musical support to specific military units or commands, premier ensembles exist to promote the U.S. military to the public at-large and to preserve the heritage of American martial music. There are currently eleven such groups. In addition to its two premier ensembles, the United States Air Force has ten additional active-duty bands: the Air Force Band of the West (at Lackland Air Force Base), the Air Force Heritage of America Band (at Joint Base Langley-Eustis), the Air Force Heartland of America Band (at Offutt Air Force Base), the Air Force Band of Mid-America (at Scott Air Force Base), the Air Force Band of the Golden West (at Travis Air Force Base), the Air Force Band of Flight (at Wright Patterson Air Force Base), the Air Force in Europe Band, the Air Force Band of the Pacific – Asia, and the Air Force Band of the Pacific – Hawaii (at Joint Base Pearl Harbor-Hickam). There are also five Air National Guard bands. In addition to its four premier ensembles, the U.S. Army fields 33 active-duty bands assigned as unit ensembles to support divisions, corps, and armies. A further 17 part-time U.S. Army Reserve and 44 part-time National Guard bands are also maintained. During combat operations, Army bands reconfigure as light infantry units responsible for reinforcing military police "by performing command post security, all-source production section security, and perimeter security for the division EPW central collecting point and EPW holding area." Though the Coast Guard does not have additional ensembles other than the U.S. Coast Guard Band, a mixed civilian/military volunteer unit provides regional musical support to Coast Guard bases. The United States Coast Guard Pipe Band is a 70-member pipe and drums band, organized into nine detachments which provide bagpipers and drummers for Coast Guard ship commissioning, change-of-command ceremonies, and funerals. Though a privately maintained and funded organization, it operates with special permission from the U.S. Coast Guard that allows it to use the name "Coast Guard." All of its members are, additionally, personnel of the U.S. Coast Guard Reserve and U.S. Coast Guard Auxiliary. The band wears uniforms of modified highland dress with kilts in the Coast Guard tartan. In addition to its two premier ensembles, the U.S. Marine Corps also maintains ten, 50-person field bands assigned to the active-duty divisions and air wings. Marine Corps field bands, unlike the U.S. Marine Corps Band and the U.S. Marine Drum and Bugle Corps, are not mission-exclusive to music. During combat operations, bands are responsible for rear-area defense, reorganizing as the security platoon for the divisional or wing command center. The 2nd Marine Aircraft Wing Band marches down New York's Fifth Avenue during the 2010 Columbus Day Parade. In 2007 the band was deployed to Iraq to provide security at a tactical air control center. The Navy has nine "fleet bands" in addition to its two premier ensembles, six of which are located in the Continental United States, the remaining three based in Hawaii, Italy, and Japan. The Navy School of Music at Joint Expeditionary Base Little Creek–Fort Story is responsible for training Navy and Marine Corps musicians. The NOAA Corps, with less than 400 personnel, is the only United States uniformed service without active-duty or reserve musicians. In the past, U.S. Navy bands have provided music for the commissioning of NOAA ships and the graduation of NOAA officer classes. The United States Public Health Service has ceremonial bands in Washington, DC and Atlanta, Georgia. Each band is funded from private sources and staffed by part-time volunteers from the Public Health Service officer corps. The combined bands, as well as accompanying choirs, are officially known as the Public Health Service Commissioned Corps Musical Ensemble or "The Surgeon General's Own". Each of the six senior military colleges, as well as the U.S. Merchant Marine Academy, maintain a cadet-staffed band for ceremonial support and performance at athletic events. The band of Norwich University, founded in 1819, is the oldest such group. 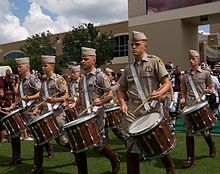 The Texas A&M University Fightin' Texas Aggie Band is the largest military band in the United States with more than 400 members. The U.S. Merchant Marine Academy is the only federal service academy not to have a co-located full-time ensemble. The student band, known as "George M. Cohen's Own," is the successor to a full-time band that was established at the school during World War II, but later deactivated. The Naval Academy Pipes and Drums was established in 1996. Several academies maintain bagpipe bands. The West Point Pipes and Drums, the pipe band of the U.S. Military Academy's Corps of Cadets, was established in 1973, while the U.S. Naval Academy Pipes and Drums was established in 1996 with an endowment from the academy's class of 1961. Both ensembles wear highland dress patterned in their respective service tartans. The VMI Pipe Band, established in 1997 at the Virginia Military Institute, wears modified highland dress consisting of standard VMI cadet uniforms with kilts patterned in the VMI tartan in lieu of trousers. The Citadels Regimental Pipe Band is composed of between 35 and 40 pipers and drummers. In 1991 it, along with the Citadel's Regimental Band, became the first university military band from the United States to participate in the Royal Edinburgh Military Tattoo. This is also the case in only three out of the currently four US Military Junior Colleges, all of them sporting military band traditions of their own. Some state defense forces maintain military bands to provide ceremonial support to their state governments. Examples include the Maryland, California, Connecticut's First and Second Companies of the Governor's Foot Guard, Georgia State Defense Force Bands, the 2nd Company Governor's Horse Guards, a mounted band of the New Hampshire Defense Force. ^ Elleman, Maeson (14 August 2012). "Kadena Protocol, first sergeant explain music customs, courtesies". af.mil. U.S. Air Force. Archived from the original on 9 January 2014. Retrieved 9 January 2014. ^ a b c A HISTORY OF U.S. ARMY BANDS (PDF). Armed Forces School of Music. 2005. pp. 13–15. ^ Raoul Camus (1976). Military Music of the American Revolution. University of North Carolina Press. ^ a b United States Marine Corps Band. U.S. Marine Corps. 1937. p. 7. ^ Dobney, Jason. "Military Music in American and European Traditions". metmuseum.org. Metropolitan Museum of Art. Retrieved 9 January 2014. ^ Army Regulation 22-5. U.S. Army. December 1986. ^ a b Kopstein, Jack (18 June 2013). "Drum Major's Headwear in the U.S. Military Bands". militarymusic.com. Military Music. Archived from the original on 9 January 2014. Retrieved 9 January 2014. ^ a b c Tucker, Spencer (2013). American Civil War: The Definitive Encyclopedia and Document Collection. ABC-CLIO. p. 1280. ISBN 1-85109-682-5. ^ DiGaetani, John (1994). Opera and the Golden West: The Past, Present, and Future of Opera in the U.S.A. Fairleigh Dickinson Univ Press. p. 64. ISBN 0-8386-3519-9. ^ Herbert, Trevor (2013). Music & the British Military in the Long Nineteenth Century. Oxford University Press. ^ a b c d Lefferts, Peter (2012). Black US Army Bands and their Bandmasters in World War I. University of Nebraska at Lincoln. pp. 4–8. Retrieved 21 November 2015. ^ "History". army.mil. U.S. Army. Retrieved 2 January 2014. ^ Hermann, Peter (14 August 1992). "Senate panel weighs eliminating funds for military bands But trumpeters and other brass oppose disbanding". Baltimore Sun. ^ Pinkus, Walter (7 July 2011). "House votes to cut spending for military bands". Washington Post. ^ Alaimo, Carol Ann (22 August 2011). "At Ft. Huachuca and elsewhere, military bands play the blues". Arizona Daily Star. ^ Davis, Mark (20 October 2013). "Budget cuts cue 'Silent Night' for Air Force band's holiday tradition". Omaha World. Archived from the original on 6 January 2014. ^ Miller, Sarah (2 July 2012). "Closing down of Air National Guard band ends a tradition". St. Louis Post-Dispatch. Retrieved 15 November 2015. ^ House takes aim at military band spending, Associated Press (June 17, 2016). ^ a b c d Beck, John (2013). Encyclopedia of Percussion. Routledge. p. 355. ISBN 1-317-74768-2. ^ a b Swanson, James (July 1983). "Eagle drums in the Civil War". Antiques Magazine. ^ "The U.S. Army Herald Trumpets". usarmyband.com. United States Army. Retrieved 4 November 2015. ^ "Air Force Band Locations & Contact Information". bands.af.mil. U.S. Air Force. Retrieved 15 November 2015. ^ "Active Army Bands". music.army.mil. U.S. Army Bands. Retrieved 12 November 2015. ^ "Army Band SRC 12113L000". fas.org. Federation of American Scientists. Retrieved 14 November 2015. ^ "1st Marine Corps District Eastern Recruiting Region". mcrc.marines.mil. U.S. Marine Corps. Retrieved 13 November 2015. ^ "Musician Enlistment Option Program (MEOP)". marines.com. U.S. Marine Corps. Archived from the original on 6 December 2015. Retrieved 15 November 2015. ^ Lacy, Linda (2004). We are Marines! : World War I to the Present. pp. 292–293. ISBN 1-59975-887-3. ^ "Fleet Band Activities". navyband.navy.mil. U.S. Navy. Archived from the original on 22 September 2015. Retrieved 13 November 2015.